I'm up for Team 2, Week 1 in the April Round Robin at Swirlydoos. The theme is "Clean and Simple", not so simple for the Swirly Savages, who love, love, love to pile on the mixed mediums and embellishments. This month, except for a bit of color on our chipboards, we're to be medium free. Of course, we need to add a bit of interest in the way of pretties, but the aim is to leave a lot of white (negative) space. There are some twists, of course, and the first is - in honor of Spring - to use some fun photos. No grunge this time; we're to submit a true Swirly style page. The last twist is to dig into our embellishments - chipboards, metals, flowers, etc. - but lightly. In Kim's words, "Embellish, but don't over embellish." I was going through my photos a few weeks ago, looking for images to include in a mini album, when these caught my eye and I copied them into my "To Do" folder, determined to use them as soon as possible. 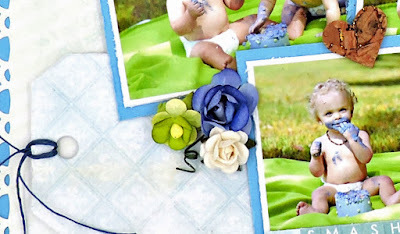 I'm going to confess that they are NOT Spring pictures (they are part of a series of a First Birthday photo shoot, taken in September 2014), but the colors are perfect and they certainly are fun! I cut some matting from the remaining cardstock and lightly distressed the pieces and the photos before gluing them together with a bit of packaging in between to give some dimension. Once I had the photos placed as I wanted them, I added another layer of packaging underneath to allow room for some embellishments. I found these chipboard pieces by Blue Fern Studios in my stash; they were given a very light coating of gesso and then embossed with Imagine Ink powder, also from BFS. More from this company - the tags were die cut from packaging that came with a set of flowers. My favorite part of this layout? Aside from the photos of The Twins, it has to be the pair of Studio Calico icons that came with the March Embellishment Add-On; I am totally in love with these little critters!!!! !